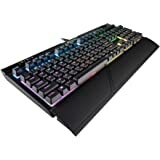 Amazon's Choice for "corsair k63"
Buy this product Renewed and save $23.00. 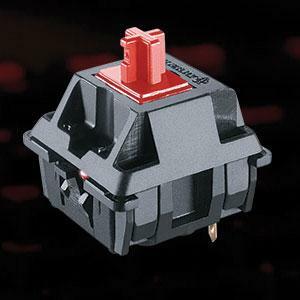 Gold contact Cherry MX mechanical gaming keyswitches deliver the ultimate performance and competitive advantage. Brilliant red LED backlighting enhances the experience with dynamic and virtually unlimited lighting adjustability. It’s great for travel, and you’ll have more room for your mouse. 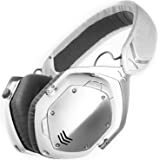 Control to adjust audio on-the-fly without interrupting your game. No matter how fast your in-game actions are, your keystrokes always register the way you intended. Fully programmable with CUE to assign macros to any key and create dynamic lighting effects. 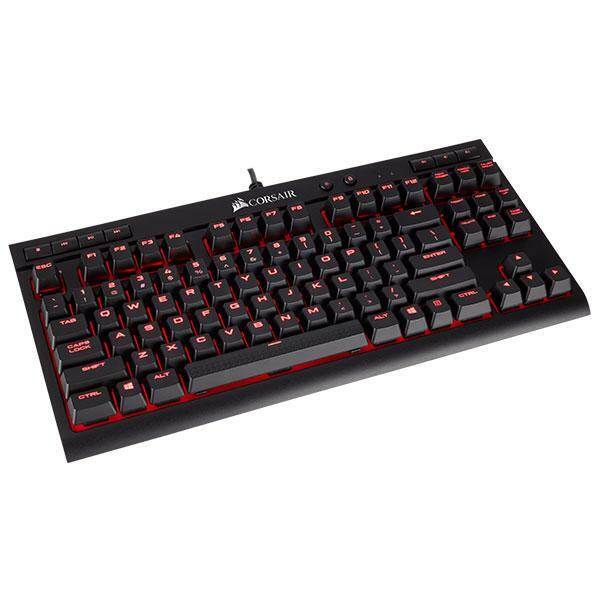 Gold contact Cherry MX mechanical gaming keyswitches deliver the ultimate performance and competitive advantage. 100% anti-ghosting with full key rollover ensures your commands and simultaneous keystrokes always register the way you intended. 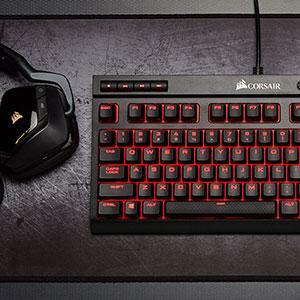 Experience dynamic, vibrant backlighting with advanced, per-key lighting control and large font keycaps. 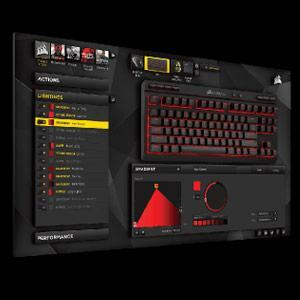 Assign macros to any key and create dynamic lighting effects with CORSAIR Utility Engine (CUE). The K63’s Windows Key Lock mode eliminates distraction by disabling the Windows key while you’re in action. 1.0 out of 5 starsGo back to the drawing board Corsair! Absolute piece of crap. My F key is stuck and my spacebar doesn't even work. GARBAGE. On my desk, I have way too many input devices. 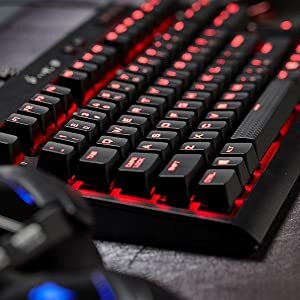 To save space, this 84 key mechanical keyboard does the job. Losing the space the numeric keypad takes up allows me to use other input devices on my desk without having to move them to different spots. With Cherry MX keys, this is a solid keyboard. Although with mech you get more clickity clack, the feedback is excellent and I enjoy typing on this keyboard. But the noise.... is less than desired especially if you stream and have to do work arounds on the open mic. Here are some things that I wish they would improve and why I gave it 3 stars. I am being very critical here because this is not a cheap keyboard. 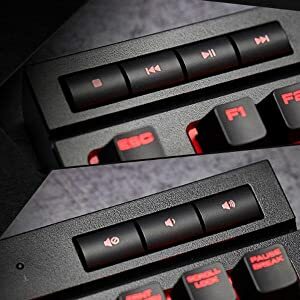 - This should be wireless. - Needs to be quieter. 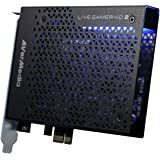 For people who stream and game near an open mic, this can be improved on the hardware end. - Price is too high. 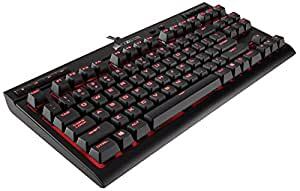 This is no more than a $80 keyboard. With less keys and plastic material being used it should cost less. - Have more ergonomic tilt angles to work with. All keyboard manufacturers screw up on this part by not allowing different angle positions on the footer stops. There should be at least 4 heights with 2 degrees of variations. - Cable takes up two USB ports. Its really a waste if one is not using the backside USB port for anything. 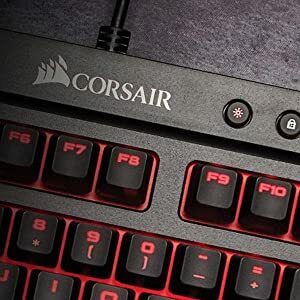 Having a mouse connected to the back of the keyboard doesn't save anything. Its still wired and just adds more clutter with more of the mouse cable on the desk. More so, I imagine an USB input controller sitting inside the keyboard that queues up both keyboard and mouse input. Let the operating system decide who gets priority. - iCue only allows up to 5 levels of lighting effects. This is really a problem for those who use applications (like games) that need to categorize lighting according to different game input categories. There is little point in owning a RGB keyboard if this is limited. 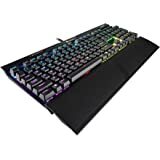 If Corsair can do all sorts of library effeccts on 16 million RGB colors, whats the problem with having more than 5 static color overlays? Its static. If the problem is you can 't refresh fast enough then you got a design problem you need to address to fix your keyboard. So fix it! 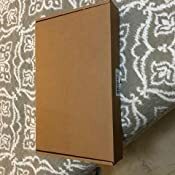 So I was sent this item by mistake when I ordered a different item, but I figured I'd leave a review anyway. For the 1.5 minutes that I held this keyboard in my hands, I have to say it felt pretty great. It didn't break in that amount of time so I would say its durability is pretty good, and it was quite easy to clean the 5 specs of dust that collected on it before I put it back in its plastic wrap. I pressed a total of 5 keys on it and the cherry mx reds live up to their hype. From my experience, pretty good, just not what I wanted. 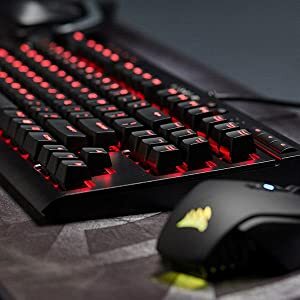 I wanted a small RGB mechanical keyboard for game play and this keyboard is everything I wanted/needed. Nice tactile response to the keys without making a lot of obtrusive sound. Love the customizable rgb lighting. Lots of options to play with there with Corsair's software, which seems to work pretty well. 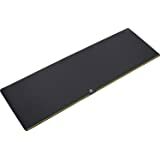 I use this on a iSkelter gaming lap board and have plenty of room for my mouse on the right and my Razer speedpad on the left. That sits on the arms of my easy chair. My monitor is on a swing arm attached to the side table. Picture included. 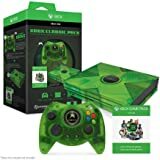 This thing is really awesome for the price. I've been looking at switching to a ten-key-less keyboard for about a year, and this one fit the bill. 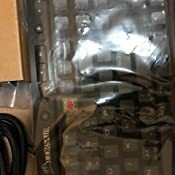 It is replacing a Razer Blackwidow 2012 with cherry mx blue switches that finally annoyed me enough to be replaced after it drank another gin and tonic and didn't come back to life unscathed. 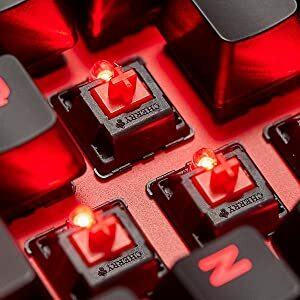 I kind of miss the blue switches, but the red are a lot more silent and better for the desktop mic that I have. 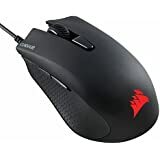 I chose Corsair because I was tired of Razer's software, and they don't use real Cherry switches anymore. 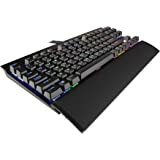 I bought my brother in law a Corsair keyboard a couple of years ago and was really impressed with the build quality and the functionality that they achieved without having obnoxious broken cloud software to keep the keyboard working (looking at you razer; it seriously baffles me how they simultaniously produce some of the best hardware and worst software to cripple said hardware). 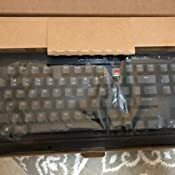 I am familiar with the build quality because of the 3 times that my sister has asked me to repair her husbands keyboard. First because it drank a glass of wine, then a jack and coke, and finally a whole bottle of wine (keyboards in my family have a drinking problem, don't ask). What was really impressive about the time it drank a bottle is that my sister was in Vegas at the time, and when she called to ask what to do I told her to unplug it and put it in a box and I would see what she could do when she brought it home. 3 months later she finally got it to me and it was moldy and nasty. I disassembled it, soaked it in alcohol overnight, scrubbed vigorously, and rinsed liberally with distilled water. After reassembly and lubricating the switches you wouldn't know that it had been through such terrible treatment. 5.0 out of 5 starsBrilliant Keyboard, Brilliant Colors, So-So Software. OK, so this is my first Mechanical Keyboard (since I had a classic PC back when). The ten-key-less design is a big plus for me, as I've suddenly recovered a large chunk of desktop real estate and given up a keyboard feature I don't actually use. The switches are wonderful - I learned on a mechanical typewriter (UNDERWOOD FTW) and these switches are just stiff enough to provide good tactile feedback. 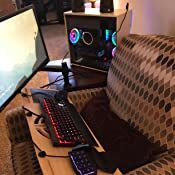 The Corsair software for driving the RGB effects is a bit... clunky... compared to what I've been using before (Logitech Gaming Keyboard) but I'm learning my way around it. 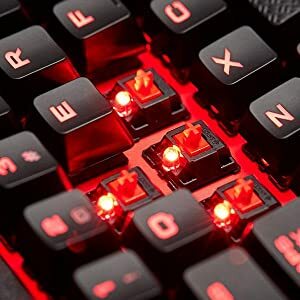 Easy to use, good response, easy to clean in case of accidents... this is the best keyboard I've ever used, whether for gaming or for general typing and such. Highly Recommend.